If hearing the words “photo booth” make you think of those drab, cramped boxes at the arcade that take blurry, unflattering pictures, think again! Modern photo booths are sleek, open, and hi-tech. It's like having a mini photo studio at your event, featuring professional cameras and lighting for high-quality shots, complete with awesome props. Certainly, your professional photographer is going to capture those special moments from your wedding: your first look, first kiss, and first dance. But nothing beats the photos taken when you and your college friends grab a pair of Kanye glasses and a mustache-on-a-stick, and jump into a photo booth! The pressure to get into just the right pose comes off when the purpose of the photo is to be whacky and fun. Some of the most amusing and genuine moments of the night will be captured on the little strip that pops out of the printer. We’ve all been to weddings where the thank you gift has been a shot glass, a bag of pastel M&M’s, or something else that soon gets tossed or forgotten about. Thank your guests for coming in a much less cliché way by sending them home with a personalized photograph or two that serves as a constant reminder of how much fun they had at your wedding. Don’t be surprised to see that photo hanging on their fridge when you stop by to visit, even months later! 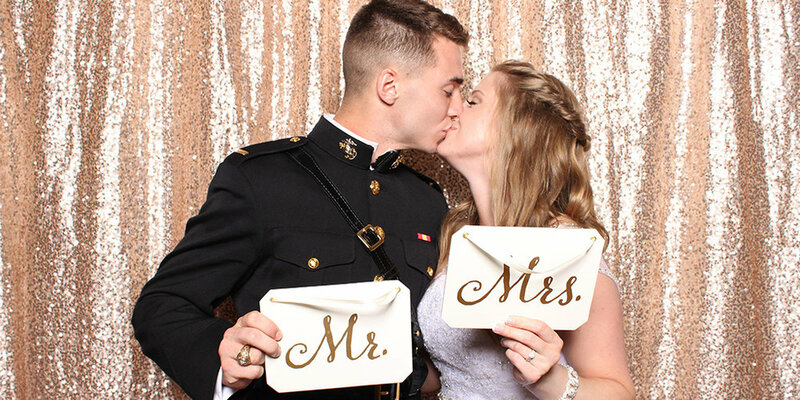 Prints from a photo booth are customizable, and can include your names, wedding date, and can even match your colors and theme, making them the perfect keepsake.